Once scorned, and facing insurmountable odds, this small band of professional psychologists changed the American Psychological Association (APA) forever. With this big statement begins a tale, told from many sides, of the determined and enduring activism of a group of individuals – the so-called Dirty Dozen. Their conversations about the need for professionalism within the field of psychology soon became a crusade in its name. 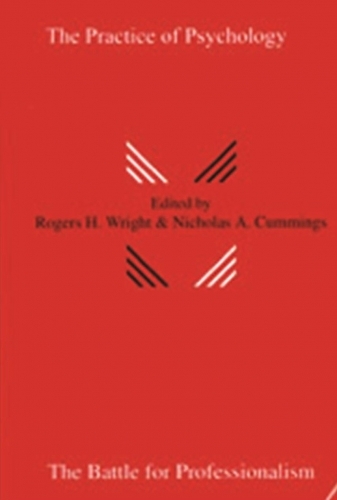 Wright and Cummings bring together the hard-fought perspectives of numerous members of the Dirty Dozen to let us in on the real story behind the rise of the “profession.” It was this group that during the course of some 50 years moved the APA from a sort of academic debating society to an organization that both reflects and fosters the psychology profession. The history is anything but staid; there is controversy, there is struggle, there is acrimony, and ultimately, there is triumph. New hot spots may emerge and others fade away, but the fight to ensure essential standards of professionalism in practice continues to be at the forefront of the field today. The editors and authors of The Practice of Psychology: The Battle for Professionalism take us back so that we may better understand how we got to where we are – and to get a better view of what lies ahead.